Investigative journalist Burton H. Wolfe presents an alternative narrative of the founding of San Francisco’s underground transit system, BART. Wolfe outlines the financial entanglements between BART’s public board and Bechtel, the family-owned firm which built and maintained the system. Investigating these entanglements, Wolfe connects the project to ethically questionable businesses and politicians around the globe, ultimately asserting that the Bechtel family intentionally deceived the public into funding an unnecessary and potentially damaging public transit system while profiting off of taxpayers’ money. "There's no reason for people to hear of us. We're not selling to the public." --Steve Bechtel, Jr., president, Bechtel Corp., quoted in Newsweek. While daily newspaper and television reporters in the Bay Area have fun kicking BART General Manager Bill Stokes around, the man who actually runs the fledgling mass transit system and makes the most money from it remains unknown to the taxpayers who foot the bill. It's time that everybody met him, because he is the individual responsible more than anyone else for the scandals that are emerging, and Stokes, basically a newspaper reporter and public relations agent, has never been anything more than his front man. 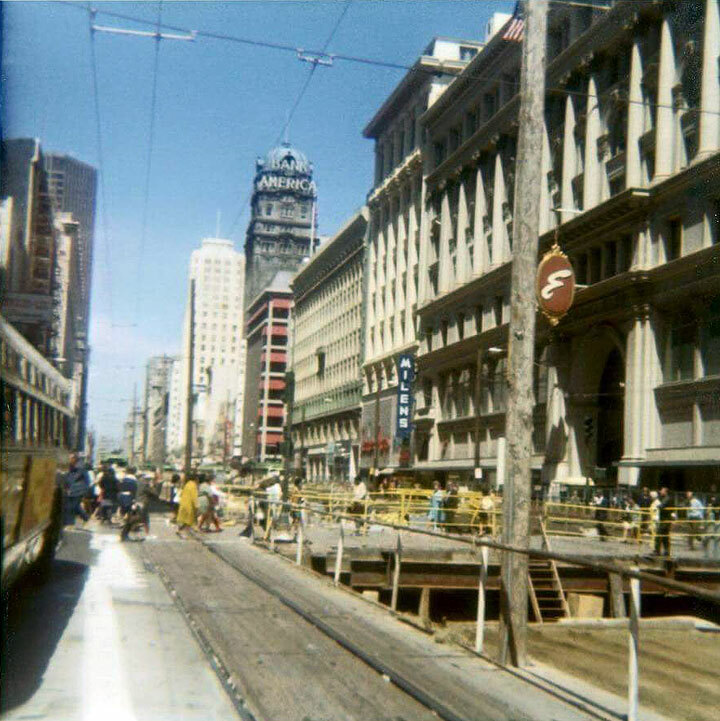 BART construction on Market Street near 4th, June 1970. This massive trench-and-tunnel operation permanently drove many mid-Market mid-level department stores out of business during the several years it took to complete. 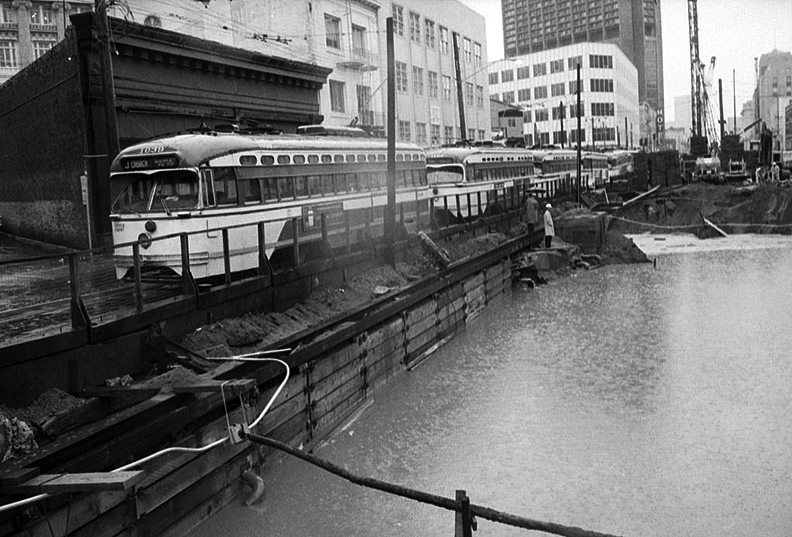 March 12, 1971 BART Construction cave-in on Market near 12th Streets. Now it can be told, as it could have been any time in the last 15 years if anyone in the mass communications media had been willing to do so: The hidden master planner, the carefully concealed czar of BART, is Stephen D. Bechtel, 72-year-old potentate of the most colossal engineering dynasty in history. Shows stages in the construction of the San Francisco Bay Area Rapid Transit system, 1967. It is true that BART has a board of directors, but it should be clear to everybody by this time that the board may as well be non-existent, since it is nothing more than a rubber stamp for the engineering firm that manages the transit system. It is also true that this engineering firm is a joint venture called Parsons Brinckerhoff, Tudor & Bechtel, or PBTB for short, and it has a titular head named John P. Buehler, who is chairman of the board. But Buehler, a vice-president of the Bechtel Corp., is like Bill Stokes merely a front man for Steve Bechtel, and the other two parts of PBTB, Parsons Brinckerhoff and Tudor Engineering, also merely take orders from Bechtel, whose cut of BART's $150 million in management fees is 90%. If all this comes as a surprise to you, it is because California newspapers have told you nothing about how BART operates and how Bechtel began planning to build a mass transit system in the Bay Area 28 years ago. That is typical of this story of Bechtel, the "quiet giant" the public never hears about. Obscure overlord though he be to the public, kings and presidents and billionaires know Bechtel well. A survey conducted by Fortune magazine in 1957 ranked him as the ninth wealthiest man in America, and in 1973 he may be closer to number one. His personal net worth is somewhere around $200 million, and the assets of his company, the Bechtel Corp., are approximately $2 billion. That figure, plus an annual sales volume of $1 billion earned from scores of giant-sized jobs in 34 countries on six continents from here to the Arabian desert, makes Bechtel the world's largest construction engineering firm. No man, no company, acquires such massive economic power without influence, and Bechtel's is prodigious. Besides running a worldwide $2 billion business empire that is owned almost 100% by his own immediate family, Steve Bechtel is chairman of the board of the California Shipbuilding Corp. and sits on the board of directors of the Industrial Indemnity Corp., Southern Pacific Railroad Co., Stanford Research Institute, and the Morgan Guaranty Trust Co. of New York. He has played golf with Dwight Eisenhower and Richard Nixon at the Augusta (Ga.) Golf Club, winged around Saudi Arabia with his friend King Ibn Saud, and wined and dined the royalty of several dozen other countries. In 1958 President Eisenhower made him chairman of the Business Advisory Council, U.S. Department of Commerce; and ever since he has been an advisor to Republican leaders, including Richard Nixon, on trade with Mideast and Far East nations. Steve's brother Kenneth, a director of the Bechtel Corp., also ranks high. He is chairman of the executive committee of the Industrial Indemnity Corp., a director and one of the top 10 stockholders of the Wells Fargo Bank, and routinely a prominent figure in the clubs where San Francisco Bay Area millionaires and multimillionaires roost: Bohemian, Commonwealth, Pacific Union, St. Francis Yacht. He has been a heavy donor to the political campaigns of Gov. Ronald Reagan and other key Republicans. Steve's 48-year-old son Stephen D. Bechtel, Jr., invested with the title of president of the Bechtel Corp., follows in the old man's footsteps. He sits on the board of directors of the Crocker-Citizens Bank, the Southern Pacific Co., General Motors Corp., and other giants. He belongs to the big clubs, he, too, has played golf with Ike and Nixon. He is currently a member of the President's Productivity Commission, on which Nixon relies heavily for guidelines to national and international investments, technology, and economic policies. And while he helps his father run BART, he is also busily engaged in shaping new ententes with the Mideast and Far East. Knowing even that much about Steve Bechtel and his family helps you understand how and why he was able to gain personal control over the largest mass transit system ever to be constructed in the west, commandeer an engineering contract that soared from an intended $47 million fee to $150 million, gain a free hand to write multi-million dollar contracts with his personal friends in the construction business at taxpayers' expense, and attract more than $200 million in federal grants from the Nixon Administration when BART was so severely drained of funds by these highly inflated contracts that the transit system seemed about to wind up a huge hole in the ground. But you will have to know still more about Bechtel to understand how he and his colleagues planned BART as the vehicle to create a second Manhattan out of San Francisco and use it as the powerhouse gateway to hundred million-dollar business ventures in the Pacific. If it sounds preposterous, if you cannot believe that you and I are paying hundreds of dollars in taxes each year for BART so that Steve Bechtel and his friends can make hundreds of millions from business ventures conducted from a jungle of highrises served by the mass transit system, it is because you do not know this man. And little wonder, since it is so extremely difficult for journalists to introduce you to him. A journalist who wants to get at him is intercepted by a battery of public relations men and one or more of around 166 junior executives who find all sorts of reasons why it is unnecessary for anyone to interview the king. That is one reason why Steve Bechtel and his family-owned company alike are referred to in the world of big business as "the quiet giant." "There's no reason for people to hear of us. We're not selling the public." That comment is only typical of an egregiously arrogant, incredibly wealthy family that views a public mass transit system as a private Bechtel project. If Newsweek cannot obtain an interview with Steve Bechtel, you can imagine how much chance I had. Nevertheless, after considerable digging, I am able through other sources to introduce you to the man and the family behind the $2 billion rapid transit construction project known as BART. It is your right, though they are after all spending a vast amount of your money. In 1945, when you and I were young or unborn or living blissfully in a rather small city that was giving birth to a United Nations at the end of a great war, Steve Bechtel, then 45, was plotting the development of San Francisco into a second Manhattan that would be the gateway to the Far East. 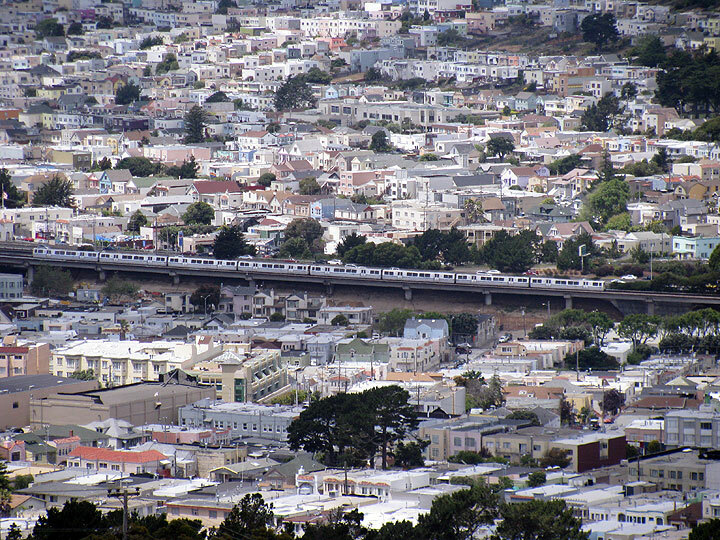 BART streaks along near Balboa Park in the southern part of San Francisco, 2011. He was not plotting alone by any means. Right in there with him were the corporate heads of Bank of America, Kaiser Industries, Standard Oil of California, U.S. Steel, and other giants. But Steve Bechtel, though he was talking to the heads of some of the biggest corporations in the world, was confident he could run the $792 million bond issue for the financing of BART. The organization was called Citizens for Rapid Transit. It was run by a three-man committee of common ordinary citizens: Carl Wente, who by this time had become chairman of the board of Bank of America, Kendric Morrish of Wells Fargo, and Mortimer Fleishhacker of Crocker-Citizens. By coincidence, these were the same three millionaires who formed the original Bay Area Council Rapid Transit Committee. Also by coincidence, the companies that put up the most money to finance Citizens for Rapid Transit were Bechtel, Kaiser, Parsons-Brinckerhoff, Tudor Engineering, Westinghouse, and Bethlehem Steel. By further coincidence, Kaiser and Westinghouse and Bethlehem were destined to be awarded the most lucrative of BART's construction contracts in the coming years. Despite the impartiality demonstrated by this organization of independent, common, ordinary Citizens for Rapid Transit, Bechtel and BART were under some pressure to justify the environmental plan entailed in BART: that is, the centralization of all commerce and recreation in a giant-sized highrise district that would be served by the mass transit system. So, for another independent, outside, impartial study, Parsons Brinckerhoff-Tudor-Bechtel brought in Ebasco Services, a subsidiary of the Boise Cascade Corp., a massive conglomerate with assets of hundreds of millions of dollars which manufactures diverse products and engages in engineering and construction, and is involved heavily in urban renewal projects. In 1953, Ebasco Services had completed one-third of a nuclear plant for the Atomic Energy Commission in Paducah, Ky., when it ran into trouble and Bechtel was brought in suddenly to bail Ebasco out. John O'Connell, Bechtel's executive vice-president, another golfing buddy of Dwight Eisenhower and Richard Nixon, was dispatched to manage the rest of the job. "It is sometimes argued that commuting is wasteful, and that the solution to moving traffic during the rush hours is to eliminate centralized interurban peak-hour trips. Proponents argue that this can be done by staggered work hours or by decentralization, in which the journey to work for multitudes becomes a neighborhood job. Ebasco's conclusion: There must be "increased centralization." "We are convinced ... that the large volumes of daily commuter traffic are not a mere accident of growth. [Ebasco's writer was not trying to be funny.] They are a necessary part of our economy and must be provided for efficiently. This requires the planning of improvements in transportation facilities. "Without transportation improvements to accommodate the mass movements of daily traffic between our low density residential areas and centers of employment, we can expect an inhibition of growth in the Bay Area. And the Rapid Transit System which would permit free flow of traffic would therefore bring an increase in growth." "Extensive transportation studies have established that rapid transit is the only feasible solution to the region's future congestion problems -- and by far the most economical solution, as well." Who wrote that for Bechtel and BART? Why, BART publicity agent Bill Stokes, who by this time had been boosted to the job of BART's assistant general manager. Despite the massive propaganda campaign and all the wealth behind it, despite full support of Bay Area newspapers and Westinghouse's KPIX television station, the BART bond issue barely passed. Sixty per cent approval of the voters was required, and the final tally was 61.2%. -- Location of routes and stations, decisions on the methods of train operation, determination of amounts of money to be spent on undetermined millions of dollars worth of job contracts, preparation for taking of bids on job contracts, inspection of contractors at work; in short "organization, planning and management of the construction program as a whole," to quote the PBTB contract's working. -- No limit was set in the contract on the amount of people PBTB could hire, or the amount of money the firm could spend on its own work or on contracts let to other companies. An estimate was set for the total fee to be awarded PBTB: $47,250,000. But every six months a new budget could be arranged to replace the previous one. PBTB had the right to run up costs of this budget plus 10%. PBTB was also to be paid 1.25 times the cost of any money spent on services and supplies. The more money that PBTB would spend, the more money it would make. How did Steve Bechtel manage to wrangle such an amazing boondoggle out of BART's directors? First, the BART directors left evaluation of the contract up to a three-man "engineering" committee. Two BART directors on this "engineering" committee, a middle-aged SF attorney named Allen Charles, and an 80-year-old Oakland department store owner named Sherwood Swan, admitted, in depositions in an early BART trial, they never understood the contract. That left it up to electrical contractor H.L. Cummings, an original member of the Bay Area Council board of directors that planned the Manhattan-BART scheme with Steve Bechtel. Second, this time Bechtel had his vice-president John R. Kiely get in touch with old friends of the family: William W. Moore, a firm that served as a paid consultant to Parsons, Brinckerhoff et al. on the original study for BART; J.R. Sverdrup, president of Sverdrup & Parcel & Associates; and H.J. Brunnier. Each of these engineers wrote letters to the BART board describing the management contract with PBTB as a good deal. And it was, for both Bechtel and his friends. In a few more years, while Bechtel would be on its way toward boosting its engineering fee to $150 million, each of the outside, independent firms that told BART's directors the contract was all right would be getting hundreds of thousands of dollars worth of sub-contracts from Bechtel, the ruler of the joint venture PBTB that manages BART. Third and finally, when the three-man "engineering" committee submitted a favorable report to BART's board of directors on the basis of testimony from these outside, independent engineers, BART president Adrien Falk, who was with Bechtel on the original scheming by the Bay Area Council, gaveled down any objections. "It is none of our business how much profit the engineers make in this contract," Falk told the BART board, meeting on Nov. 29, 1962, to vote. "It is none of our concern." Of no concern to the sole public body that would have any control over how the engineering fee grew from $47 to $150 million? And yet that amounts to a relatively small sum compared to the money Steve Bechtel and his friends are earning from the successful conclusion to their plan of using BART as part of a scheme to convert San Francisco into Manhattan West, the powerhouse gateway to the Eastern Hemisphere. Bank of America, operating out of 52-story highrise world headquarters here, now has 32 branch offices in the Far East and owns many companies operating there. Wells Fargo, with its 32-story highrise on Montgomery (now truly "Wall Street West") that has an underground entrance to BART, and Crocker Citizens with a highrise diagonally across the street also connected to BART, have put up offices in Tokyo, Manila and Hong Kong. In 1970 Crocker Citizens had accumulated enough capital over there to form the Australian International Finance Corp. to run hundred million-dollar operations in Australia and New Zealand. In 1971 Wells Fargo was able to form a behemoth affiliate called Broadbank Corp. to run its equally lucrative ventures in Australia and New Zealand. And don't forget old Morty Fleishhacker, the good liberal ex-president of television station KQED, who started telling us all back in 1950 that BART would be a great civic crusade to get rid of the automobile and air pollution, and who now sits on Mayor Alioto's City Planning Commission telling us how wonderful highrises are. He should know; he has a big chunk of the Golden Gateway Center highrises. But the biggest payoff for Morty is over in the Far East, where he now spends half his time on behalf of the Natomas Corp., of which he is vice-president and second largest individual stockholder. Mort has a lot of work to do over there through the companies Natomas owns: American President Lines, Indonesian American Petroleum Co., West Indies Oil Co., and Natomas Arabian Oil Co.
We will have the Bay, of course, if that is not filled in, too. But you won't be able to see it for the highrises and air pollution. You will be walking on streets where the sun, blotted out by gigantic buildings, never shines, one of a million ants on the anthill, one cog in a machine that keeps churning with no purpose other than to grow bigger and make more money for the multi-millionaires who run it.